Last post was about the Idea-ology booth. We also get to add the projects in the Sizzix Alterations Booth. Check out the umbrella that they incorporated to the chandelier....so cool! This is the flip side of area in the booth shown above. A cute wall that resembles a quaint cabin. Some of the projects up close, all made with new Alterations dies. By Jim Hankin - Featuring the new Pocket Watch Frame and Picture Wheel. Greece altered book project by Debi Adams - Featuring the new Picture Wheel, Pediments and Stacked Artful Words. Rosette Ribbon by Amy Baldwin - Featuring the Paper Rosette, Picture Wheel die with a Compass Coin and Game Spinner in the center. Lucky ladies getting one of the new stamp sets! We also help to set up props in the Stampers Anonymous booth. One of my favorite things in that booth are the original drawings for all the blueprint stamps. We also get to help with Tim's education class. This is a large class of approximately 80 people. He demonstrated how to use the new Distress Paint, Embossing Paste on the new Burlap Canvases. Great class, with a generous amount of product and lot's of great product information. In the Ranger Booth at every show they have the RANGER DESIGNER CHALLENGE and invite artists to participate. This time 16 artists were invited to create a piece of art on a canvas using one color of Dylusions Ink Spray. They could also use the Black and White Sprays. I might be biased, but Paula and Tim canvas's were my favorites. Very different in their styles. Check out the others here. It is always interesting to see how different they all are. Before we know it, it will be time for CHA Summer that will be held this year in Las Vegas.....should be fun! ps) we brought home a few of the beautiful fabric tote bags from the show. If you would like to win one please leave us a comment and tell us what is the "tim" product you are most looking forward to working with? Is it one of the new dies from Sizzix Alterations? or the new configurations book from Idea-ology? How about the new Distress Paints from Ranger? Gosh, so much to choose from!! We will post the winners names on Wed morning! Good Luck! Gorgeous decor! That umbrella chandelier is awesome! Love it! Great idea! The photos are amazing. I have to admit I am clueless to this art, but I can imagine how thrilling it must be to be there in person. You all look so happy! You're right, too much to choose from. But I'm seriously luvin' all the travel related dies and texture fades. Can't wait! I've been watching alot of the video's this weekend and I think I'm the most excited about the distress paint. Because as he said, it's such a different animal and I love how it stays permenent after its dry and you can add on top of it...Many uses!!!! I think Im in love with that darling little Locket Book!! What a wonderful show. So many great new products to look forward to. I'm loving the clock that you can tun into a shadow clock box. Also loving the clip board die. More blueprint stamps are a must as well. Its Tim overload for sure. no questions...the eiffel tower alterations die...and any new texture fades! thanks for all the pictures and descriptions! posting all this is a lot of work! and now that I have taken the time to go look at all 16 Dylusions canvases for the Ranger challenge, I can honestly say that Paula's is my favorite...love the colors combined with the vintage feel...that's why I think you two rock! Nonnie, the check is in the mail. I look forward to using the alarm clock! The new Distress colors.. though that clock shadow box is really intriguing. I really like the picture wheel die, and of course I can't wait to get my hands on the new Distress Paints! Honestly it is impossible to pick just one but I will say I have the Distress Paints on pre-order. Then I will be ordering all sorts of Idea-ology and Sizzix products. Cannot wait. Some of the new dies, my latest obsession :) Can't WAIT! I badly need, need, need, all of the new products buy I think the Distress Paints is a first must have! Interested in the new dies and the distress paints. I really want to use the new picture wheel and pocket watch dies. Love the vintage look of these. I am fascinated with the configurations book and I am dying for many of the new dies. I don't know how you did all the work on the booths but they are amazing. Paula's canvas is my favorite. She always knows how to use color and detail. Wow! What a super cool giveaway. The tote bags are gorgeous. I am most looking forward to getting my hands on the Ideaology Assemblage clocks. OMG they are just too cool. I just loved all the design samples especially Jim Hankins' working model. Thank you so much for the opportunity to win one of these beautiful totes. Firstly, Paula your design piece is beautiful, so vintage & feminine. Next, the question. A tough one. Tim has outdone himself once again. But, I'm probably most looking forward to working with the new distress paints. Inky, yet acrylic. They're inspired. I agree about the paints. I don't have any yet so I am also looking forward to experimenting with them. I can't wait to get my hands on some Distress Paints. Loved watching Tim demo this. While I am excited about the paints and I have to say that's where my first thought took me, I think it is the blueprint stamps. When the first sets came out, it took me a bit to warm up to them, but NOW I just think they are .... well .... very cool and very fun to work with. I also have to say that I think Paula's canvas is drop dead gorgeous...great to see it up close. Thanks for sharing! I just love all the up close pictures from CHA - are you girls still pinching yourself that you get to work with Tim?!?!?! I am supper excited to try his new distress paint but the new idea-ology metal that is coming out just makes me swoon - I mean, come on, those buckles, that clock and those pulls - perfection! i Would love it all. The picture wheel die was pretty awesome. Wow thanks so much for sharing!! I can't wait for the new stamp sets! They are so versatile, but lets face it, everything Tim is versatile!! Have been really looking/gawking over the pictures you have posted of the show. So many talented people and projects! Can't wait to get my hands on the new paper, along with several other things! I want the viewfinder wheel so badly! I already have so many ideas to create with it. i love the blueprint stamps, sort of industrial, steam punk looking. thanks for sharing all your pics. it looks like cha would be such a fun place to visit. thanks also for a chance at a bag, i neeeeed the one with the butterflies, lol. Almost like being there - the displays are exciting. I'm partial to those industrial stamps -and I just love the *lucky girls* contributions to the booths! I loved all the pic! Gorgeousness! Everything is full of yummy ink and paints. Well, i think my favorite goody from Tim would be the alarm clocks. I love to alter items and those alarm clocks would more than make my day.! & I must say you art for the show was fabulous! Its a hard decision but its between the embossing paste or the burlap canvas. It is a new concept for me to have a play with and cant wait. Thanks for the fabulous highlights from the show, cant wait for all the new products to hit our shores "downunder"
I think I would love to try the distress paints - they look so much fun! I can't stop buying the "tim" dies from sizzix...so I guess I would like to use the "new" ones that are hopefully coming out this year! Thanks. Oh, wow, oh wow, oh wow! I want, I need, can I have......it has to be the paints. Love the spin the gypsy girls have put on Tim's things....just can't get any better. Thanks for sharing! Can't wait for Scrapbook Expo in Orlando!! I love so much from Tim's CHA release it's hard to pick just one thing!! Is it the new blueprint stamps or the gorgeous new sizzix dies or the fabulous new distress paints?!? I'll probably go with the Paints!! I can't wait to get the assemblage clocks! I love seeing your talents mixed with Tim's --what a great combination! I am most looking forward to working with the new Distress paints, but of course I'll have to pick up many more goodies from this release. It was brilliant! I wish I could have been at CHA to see all this awesome stuff in person!! I'm looking forward to so many Tim products, but I think I'm most looking forward to making something really cool with that pocket watch!! WOW! What cool stuff! I love Tim's products! I can't wait to use the Distress paints. Thanks for the wonderful giveaway! Thanks for all the behind the scenes peeks at CHA. It is fun to see all the goings on and the products. It is really hard to pick just one product, but if I have to, I would say the new distress paints. I am excited about all they can do, the colors, etc. . . I would be thrilled to win and I thank you for the chance to enter. I was lucky enough to get to CHA and see your booths in person, and they were FABULOUS! i am sooooo very excited about the Distress Paints...We spent a lot of time watching Tim demonstrate them....loved the marbling technique! I'm really inspired by what Tim's products can create. I would love to experiment with the new distress paints after seeing some of the finished art work that was displayed at the show. I can hardley pick out one thing to be excited about. The new distress paints sound like fun and as always the new stamps are fantastic. I love all the products. The booths are amazing. I'm excited to try the Distress paints! I can't wait to get my hands on the Distress paints and I also "need" some of the stamps. There was so much that I wanted that I have to go back to Tim's blog and look at all the previews again. Thank you for the chance to win. OMG...you expect me to pick just ONE?!?! I love ALL Tim's new stuff...papers, dies, ideology and those Distress paints...gotta have the ALL! If I really have to pick...the first things on my wish list are the Distress paints. I can use them on so many different projects. I am in love with the distress paints, and Tim gave me a tag! 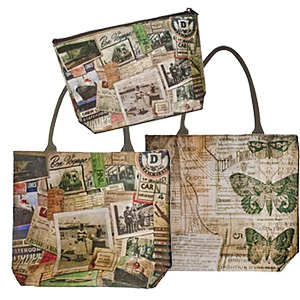 I am looking forward to playing with the new blueprint stamps and those fabulous burlap panels! love Tim's stamps! they're amazing! 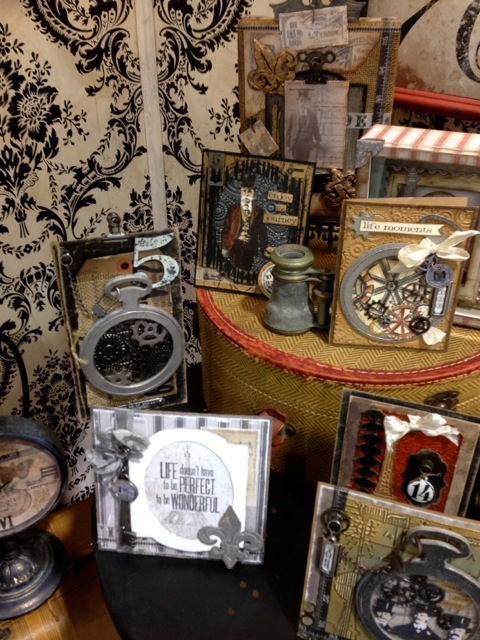 With my husband being a custom designer in his fine-jewelry business I would find it delightful to make a gift for him using the Pocket Watch Frame and Gadget Gears dies by Tim Holtz! What a FUN gift idea!!! I want the picture wheel die, I think that will be so fun to play with and the distress paints!!! So much detail went into every booth!! I'm most looking forward to using the Blueprint Stamps. I love them all. I need to get my hands on a picture wheel die! There is so much new stuff that I can't wait to play with but mostly the Distress Paints. I can't decide what I'm most excited about - the new paints, the new architect stamps, the compass pieces, the new tissue tapes, the MOUSTACHES, and sooooooooo many more. The ideas are working overtime and I can hardly wait for those products to come out. Table is cleared and ready! Please hurry! There is so much to choose from! But I must admit I am intrigued by the Distress Paints, many many many possibilities! So hard to choose... the one with the most "pull" is the picturewheel die, though-- my viewmaster was my favourite childhood toy. The booth is stellar, ladies. Wow. The Moustache is a must have & must get from the moment I clapped eyes on it. It makes me smile & I can think of so many things to do with this die. I just have to say that everything 'Tim' in this show is stunning. It would be my lucky day indeed if I was to win. Thanks for sharing and inspiring. The clock box. The locket book. Mostly the distress paints. Love everything! So very inspiring. I can't wait to get my hands on the new distress paints. Oh my gosh! All the different things you can do with it!! The most frustrating part for me here in Africa, will be to wait for those Distress Paints to get here! Cannot wait to get my hands on them! I'm lovin' the new distress paints. Sooo beautiful. The paint, the paint, the paint!!! I can't wait for the paint! I am having a hard time picking just one thing I want to play with! 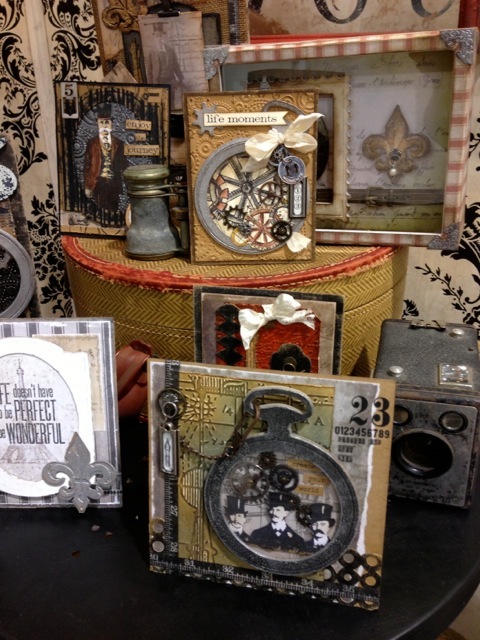 I am excited over the new configuration books , the distress paints and the view master die! I really want everything! And some day I will!!! I am so glad the show was a huge success! Thanks to all your hard work! Love all the displays including the junked ladder! the pocket watch frame! I'm in love with it! The projects are amazing - thanks for the close ups! I can't wait to play with the Eiffel Tower die, the seamstress blueprint stamps and the new papers. I have become quite the 'Tim Groupie' lately! The new stamps or the distress paints ... so hard to choose ! This is a beautiful giveway and so inspiring. Without a doubt. Distress Paints. Number one thing at the top of my list. With stars and arrows pointing at in in case I forget it's number one!!! I am a 'die' girl; can't wait to play with his new dies!!! And the paints---very exciting! thanks for sharing... fantastic pics & inspiration! Be a while before any of these new products get 'downunder', but I'm keen to play with the French Industrial paper, stamps, paints and dies....couldn't choose just one!! OH MY!! you want me to pick one!!? I love the "view master" die - the fabulous new paints and the clock box..so many I am dieing to get my hands on! So much planning and work goes into these shows! The Ranger Team makes it look so easy!! I had a "come to Momma" moment with the new hard back book covers...I can see a library in the making...the best thing...I will be the author! This post is fantastic, as are all of the ones you girls write. And thanks for the chance to win a fabulous tote! The new item I am super excited about is the distress paints. I love the dabbers, and have oodles of them. I have the markers--not all, but my faves. I love love love the distress inks--have almost all of them. But with all my mixed media work, I always always always use acrylic paints and now I am super excited about trying out tim's new paints! Thanks for the photo views of all the creative displays at CHA Anaheim. What a treat it would have been to be there and take in all the new designs! Looking forward to perusing all the design challenge results too--from the best artists in the field! Love your soft vintage take, Paula--such a contrast to Tim's masculine grunge!! And I can't wait to play with the new "inky" Distress paints! Thanks for making me feel like I was there. How can I choose just one new product? I want them all. My first purchases will be sone of the new stamps since Stampers Anonymous will be at the stamp convention I'll be at this weekend. I really like the pocket watch die. I'm thinking of a shadow box using it. I can't believe all the work that goes into those booths...and all the cool props! I definitely want that clock and alterations book, but there are also embossing folders, stamps and dies that are on my wish list! It will probably take me til Summer CHA to get all the stuff on my list! forward to the paints as well. As a Seamstress(when I am not "Timming"),I am very excited about the Blueprint Sewing Stamps! I also love the Clipboard Die-I see so many personal applications for both! I really want to do my version of the Greece altered book project by Debi Adams. So of course, I would love/need the new Picture Wheel, Pediments and Stacked Artful Words. Well I love it all, but especially the locket book; the tissue tape and the viewfinder die. Oh yes, and the worn book covers. Can't wait to start purchasing the new stuff. Thank you for a chance to win one of the awesome fabric bags. I am a bag lover and would die to have one. I am excited about all the new Tim products, especially the blueprint stamps and the viewfinder die!! I cannot wait to try the distress paints! I have an altered book I am working on and these will be great to cover the pages which are slick. That and the blueprint stamps are my favorites. All so beautiful! I am excited to work with the blueprint stamps -- love those images! And the new Distress Paint. I have to have that pocket watch die. Love all the blueprint stamps. No way to choose just one thing!!! Awesome pics! Thanks so much for sharing all the talent and fun! I'm most looking forward to distress paints! I'm looking forward to getting my hands on all of his ideology products! Love Paula's canvas - gorgeous! Hands down, the new distress paints! Of course combined them with some new dies - especially the picture wheel! Can't wait to work with the clock! Configurations book, yes that's it. Or maybe it's the Distress paints, no, no, it's the dies, or maybe it's the clock! I give up...I want it all! One just one?! Besides the new paints I cannot wait to get my hands on the new pocket-watch die and the alarm clock...well along with the configurations book. What a great email! Thanks for sending the photos of all of the samples and product ideas. I can't wait to try the configurations book - I have lots of ideas. I can't wait to try the new distress paints! What an outstanding job you did with display. It is just like walking through an art museum. And I love what you did with Paula's ladder! Really excited about the new Distress Paints. Squeal! I am obsessed with the Sizzix Dies. I currently own so many my friends and the lady (another friend of mine) who owns the nearest Scrap book store are beginning to think I am stalking Tim Holtz and his design team...well I guess I sort of am! fabulous ribena, that is just what we want. stalk away! I'm looking forward to the new papers! Very cool! I'm also trying to resist the new paints! I love all the new products, but I have to have the Distress Paints before anything else. Can't wait! It has to be the Distress Paints...can not wait to try them on clay and fabric and metals!! oh dear...so hard to choose! I do like the clock and the Book Covers - they seem to be "calling me" the most. Love all the photos from CHA - so inspiring! Thanks so much for sharing! i love the blank alarm clock!!! The Worn Book Covers are at the top of my list! And the more photos I see of the booths, the Alarm Clock in becoming a close 2nd! Oh yeah....the new dies and distressed paints...that's what I'm talkin' about! Sigh. I cant wait to try several of the new stamp sets and dies. Of course the book is without question, a "need "
Surely you must be joking...picking just one of the new products as a favorite would be impossible for me. I am looking forward to the new french papers, the worn book cover, and always the new stamps! There are several things I'm excited about in Ideology, especially the wishbones and that incredible souvenir locket. And those pediment dies, yikes. Configurations Book and the Distress Paints! Love, Love, Love them! Loved the ladder also that you found on the side of the road. Can't wait to get my hands on the Distress paints. They will work so well with all the other Distress I have. I want that picture wheel die...it reminds me of the Viewmaster I had as a child. Oh, and those Distress Paints are calling my name!